Chelsea boss Maurizio Sarri is reportedly keen on the idea of securing a reunion with Napoli forward Dries Mertens at Stamford Bridge. The Belgian international flourished under Sarri at the San Paolo, bagging 34 goals in 46 games in the 2016/17 campaign before adding 22 in 49 outings the following year. In total, he’s now scored 203 career goals in 553 appearances, and although he will turn 32 next May, he continues to play a crucial role for the Serie A giants. However, they could face a battle to keep him in Naples, as Calciomercato note that Sarri could explore the possibility of prising him away and sealing a reunion at Chelsea. With neither Alvaro Morata nor Olivier Giroud offering a consistent source of goals and with Eden Hazard arguably less effective in a false nine role, adding another striker could be crucial for the Blues. Coupled with the threat that compatriots Mertens and Hazard could pose together at club level, it might be a sensible swoop with the former now naturally capable of playing up top. 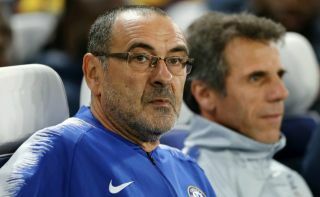 Nevertheless, it remains to be seen if such a deal materialises, as Napoli will surely be eager to avoid a situation in which Sarri continues to take his former players to west London, just as he did with Jorginho this past summer. Further, as noted in the report, it’s suggested that Mertens is happy at Napoli, and so it could take some work to convince him over a move to England at this stage of his career. In contrast, with Napoli continuing to trail Juventus domestically and having dropped out of the Champions League again in midweek, a move to Chelsea could provide him with a better chance of winning trophies while working with the coach that brought the best out of him not so long ago.